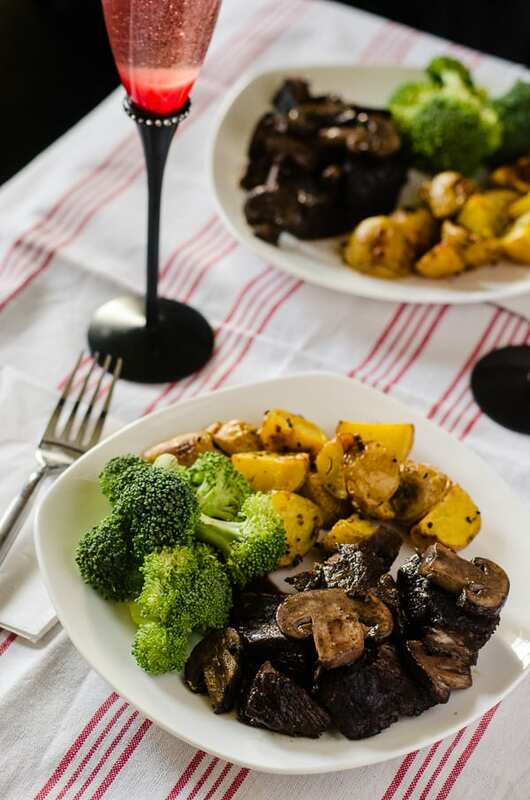 Tender, juicy beef, braised in a delicious red wine & mushroom gravy – served with herbed roasted potatoes and your favorite veggie, it makes for a wonderful Sunday Supper! Time tends to get away from me, and the fact that 2016 is here just reminds me of how fleeting the clock can be. Having arrived on the other side of another year is both sad and a thrill – I left behind an incredibly prosperous 365 days, but the potential for the next 365 is absolutely unlimited! I already have some great things lined up for myself and my family and friends in the coming months. As far as this little blog, it’s brought me more joy than I thought possible. Becoming part of the Sunday Supper Movement last year made The Crumby Cupcake mean that much more – it challenged me in many ways, introduced me to some wonderful people, and helped to expand my knowledge of both food and the world of blogging. I’m beyond thrilled to be part of the community, and this year, for the first time ever, we’ve hit national holiday status! That’s right! Every January will now be National Sunday Supper Month, with January 10th being Sunday Supper Day. Today, we’re celebrating kicking off the big month with a huge collection of wonderful recipes, shared specifically in honor of the special occasion. I’m happy to bring you one of my all-time favorite recipes from my hubby’s repertoire. 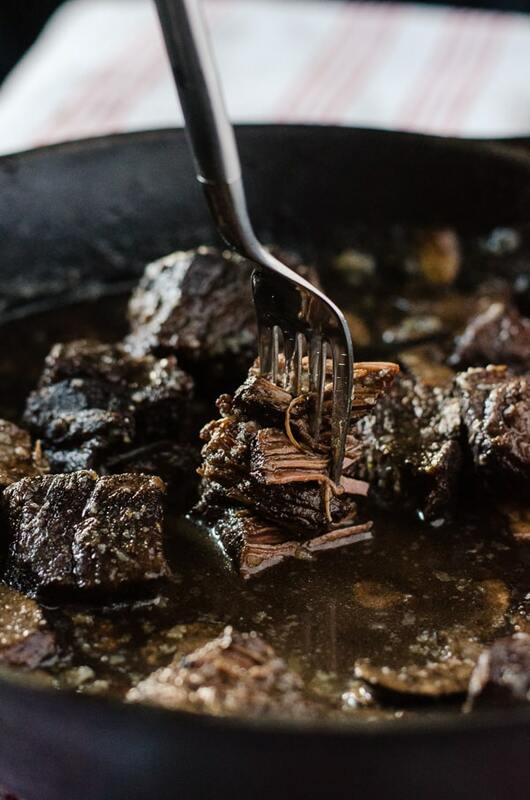 We had a variation of this dish (made with short ribs) for the first time while choosing a wedding caterer in early 2012, and I became obsessed with the juicy cuts of beef. Mr. Crumby tried out his own version for my birthday dinner that same year, it was a hit on our wedding menu, and it has become an often-requested (by me) dish in our home over the last three years. In spite of the fact that braised beef is often served with mashed potatoes, I’m a fan of the roasted potato side – swirling them around in the delicious gravy is super delish, and adds lovely flavor. More often than not, it’s either one of us handling dinner at a time, not usually both (our kitchen isn’t that big!) – but I had a hand in this one by prepping the potatoes. They’re pretty tasty, also, and are a wonderful compliment alongside his perfectly crafted beef. I am one lucky woman, in more ways than one. Here’s to a new year, new experiences, new foods to try, and new memories to make! Trim the chuck roast, removing the biggest pieces of fat. Season the beef with salt and pepper and place covered in the fridge. Add 3-4 pieces of trimmed fat to a medium saucepan set over medium-high heat with half of the wine, bay leaf, oregano, salt and pepper (to taste,) and 1/4 cup mushrooms. Bring sauce to a low boil, then reduce heat to medium, and allow the wine to reduce by about 1/3. Add the remaining wine and mushroom gravy mix (or cornstarch) and simmer 20-30 minutes until thickened and reduced. Season the beef with salt and pepper. Sear each side in a cast iron skillet. When sauce is ready, strain it through a fine mesh sieve into a bowl, and add sauce to skillet. Cover skillet with foil and bake for 1 1/2-2 hours, until tender. In last 10 minutes of cook time, add remaining mushrooms and toss with sauce. Serve with potatoes and favorite vegetables, and enjoy! 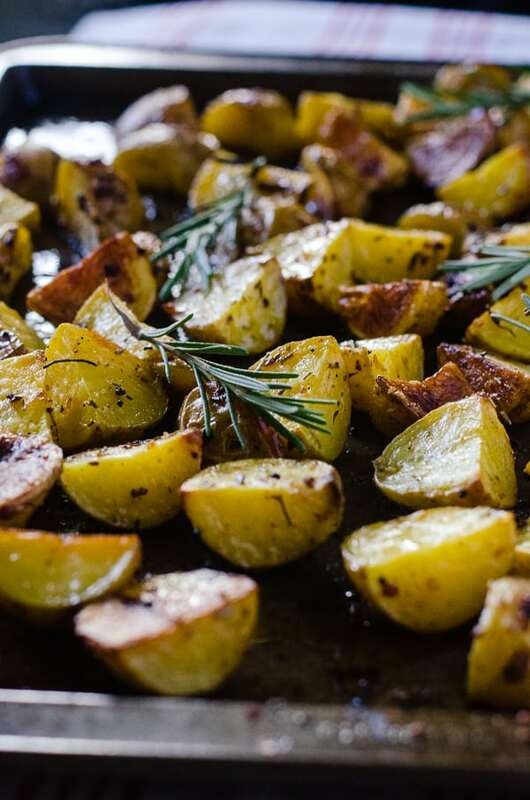 Preheat oven to 400 degrees F. Line a baking sheet with foil and drizzle with 1 Tablespoon olive oil. Set aside. Place remaining ingredients in a large bowl and toss to combined. Spread evenly on baking sheet, sprinkling more Parmesan on top if desired. Bake uncovered for 25-30 minutes until potatoes are tender. Remove from oven and toss with butter, coating evenly. Top with fresh rosemary sprigs and more grated Parmesan when serving if desired. 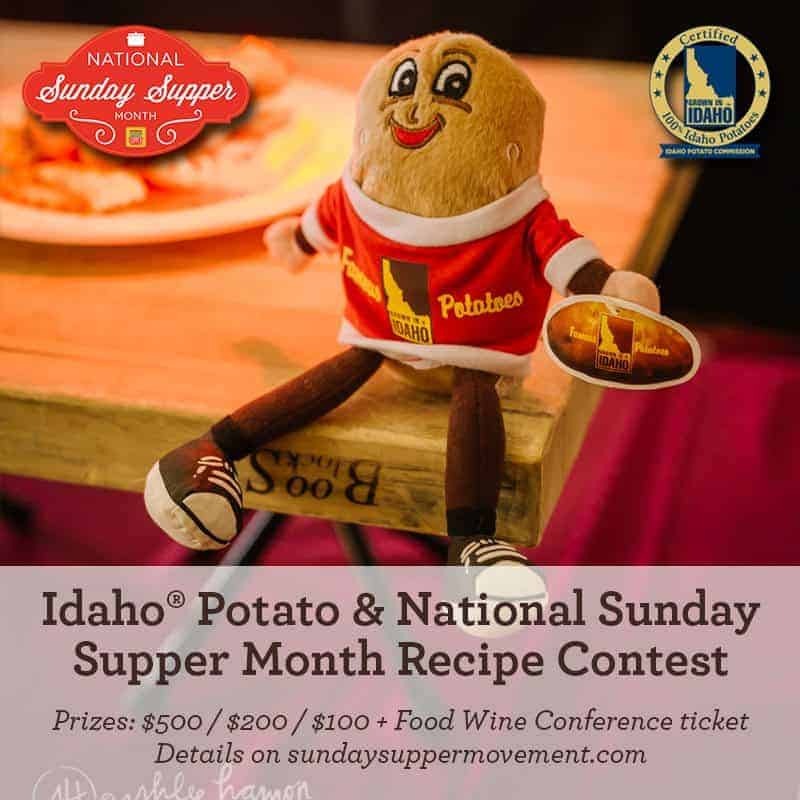 How will you celebrate Sunday Supper Month with us? Join the celebration with me and the rest of the crew – here are 60 amazing recipes from our community! I can see why this is a favorite, Erica! It would be at our house as well. Whoa, this beef looks amazing! It would surely be a hit at our house, too! This looks amazing! Love the gravy! I can definitely see why this is a favorite recipe! I know my husband would love it! You are one lucky woman and talented too!! Perfect for Sunday dinner, can’t wait to try this! Such a delicious looking stew! I’m sure my husband would love it as well. YUM! You cannot beat a good braised beef dish, in my opinion, and Mr. Crumby’s got it going on with this one! What a delicious Sunday Supper to start the new year! Nice work, lady! This looks incredible. I have to make it! You had me at red wine. This beef looks heavenly! That’s essentially my selling point, too! Thanks for sopping by, Lauren! 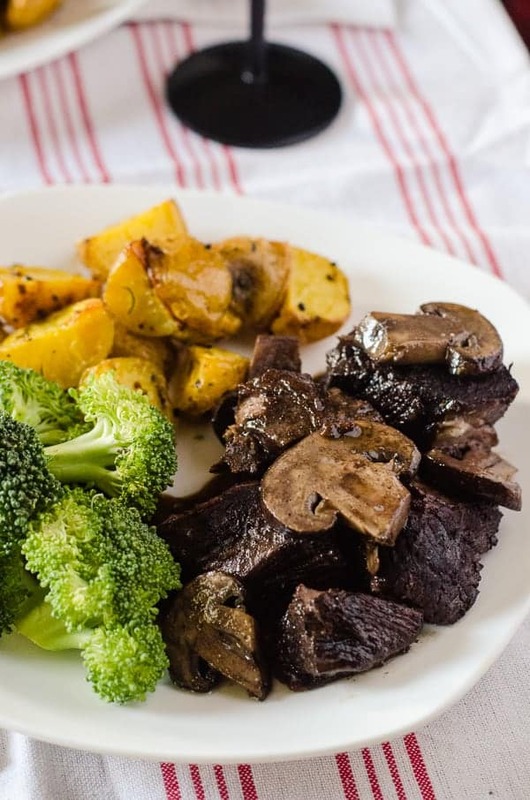 Braised mushrooms AND beef in wine? I’m there! 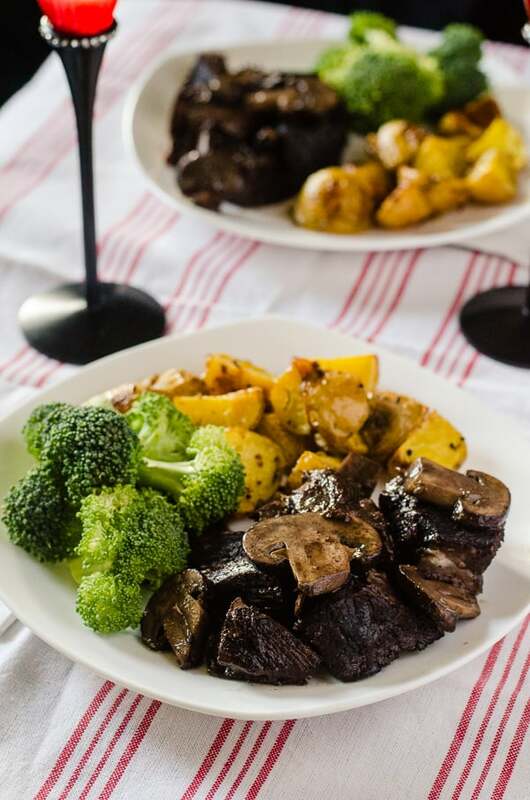 Red wine and mushrooms are the perfect complement for braised beef – this looks terrific!